1 Garden, 24 Hours, 184 species! …and counting! Last Sunday, the 5th, I took part in the Garden Bioblitz for the first time. The aim of a bioblitz is to record every species you find in an area within a period of time. For the Garden Bioblitz, you record every species you find in your garden during a 24 hour period. Great Oak Beauty – annual in Domewood, but Nationally Scarce B (NB). 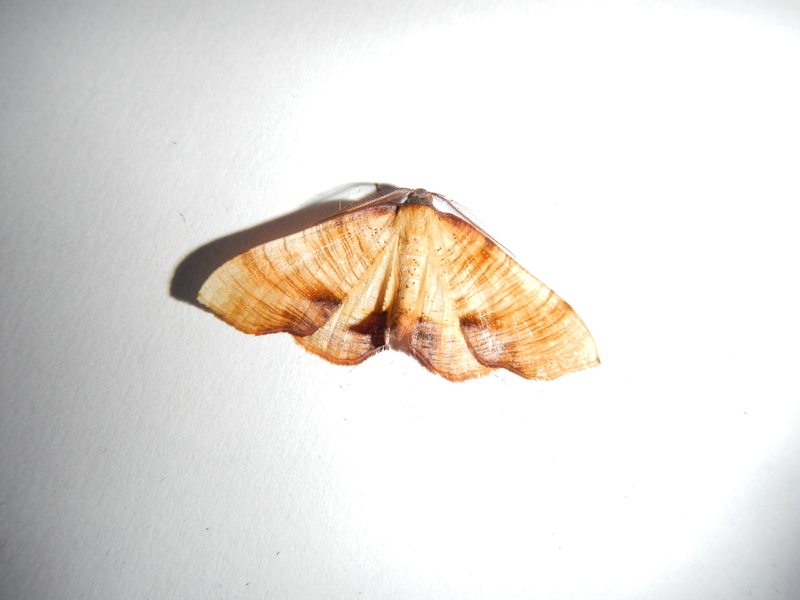 Scorched Wing – a beautiful moth which is also classed as Local. There were 8 in the trap. Peach Blossom – a great moth with a great name although quite common. 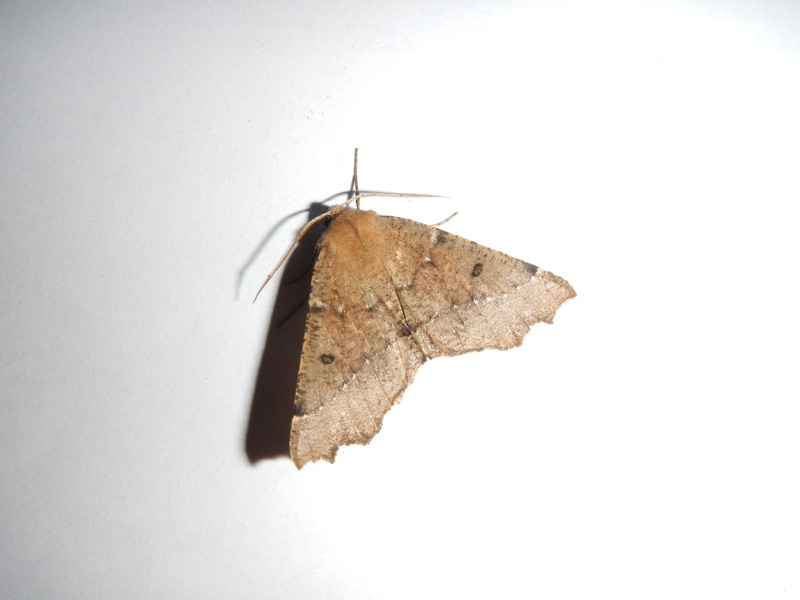 Cypress Carpet – quite an uncommon moth, which arrived in Britain through its host plant, cypress. There are lots of Lawson Cypress trees in the garden which probably explains its occurrence here. Diamond-back Moth – for some reason, I rarely see immigrant moths. The Diamond-back Moth is only the third immigrant moth I’ve recorded. I recorded it for the first time during the last weekend of May, but there were 29 in the trap! I also caught a very interesting beetle that had a very pungent smell. I thought it was a sexton beetle and I was right. However, I wasn’t too sure which species it was. It was all black and luckily there are only two all-black species in the British Isles: Necrodes littoralis (the Shore Sexton Beetle) and Nicrophorus humator (the Black Sexton Beetle). It turned out to be the Shore Sexton Beetle due to the antennal clubs not being brushes as in the Black Sexton Beetle. Thanks to Chris Brooks on iSpot for the identification. Sexton beetles are interesting because they feed on dead animals. If the dead animal is small then they will bury it to keep other scavengers from taking it. They do this by excavating the soil under the body so that the dead animal sinks into the ground. The adults lay eggs nearby and when the larvae hatch they crawl to the dead animal to feed and even be fed by the adult. Even though this beetle was caught in the moth trap there isn’t necessarily a dead animal nearby as they can fly quite long distances in order to find their food. After I had finished looking through the moth trap, I walked around the garden listing all the wild plants. Before I added the plants I already had a list of almost 70 and there was still lots to identify! Other non-moth highlights included a Canada Goose flock flying over and the first Grey Heron I have seen fly over the garden in more than a year. After I finished off the plants I had breakfast, meaning that I had a list of 130 before breakfast. Things were going well! After breakfast I looked under the logs and stumps in my garden. As always, they were brimming with slugs, beetles, woodlice and other creatures. The most common ground beetle was Agonum emarginatum, a species usually associated with damp habitats near freshwater. This makes sense as most of the stumps were near our tiny pond. The list of slug species was quite good too: Budapest Slug, Leopard Slug, Yellow Slug, Dusky Slug, Greenhouse Slug and Ambigolimax nyctelius, the species I found new to Surrey last year. When I first found it I had to send it off to Wales to get the genitalia looked at, but this confirmed the scientist’s suspicions that there were slight morphological differences between Ambigolimax nyctelius and the Greenhouse Slug. In my experience, Ambigolimax nyctelius is more boldly marked than the Greenhouse Slug. It seemed to be all black except for the last 4 or 5 abdominal segments, which were off-white. So, I’m currently on 184 species and hope to identify a few more for my bioblitz list. The week of 13th to the 17th of July, I went to Teifi Marshes, the home of the Welsh Wildlife Centre. It’s owned by the fourth largest Wildlife Trust in the UK, the Wildlife Trust of South and West Wales. Nestled on the banks of the River Teifi between the town of Cardigan and the village of Cilgerran, Teifi Marshes is known for its Otters. We stayed in a tiny but cosy cottage near the visitor’s centre, with access to the reserve well after all the other guests had left. That meant we stood an even better chance of spotting Otters as they’re a nocturnal mammal, but we didn’t have much luck. We arrived at our cottage at 5 in the afternoon and began the process of unpacking. 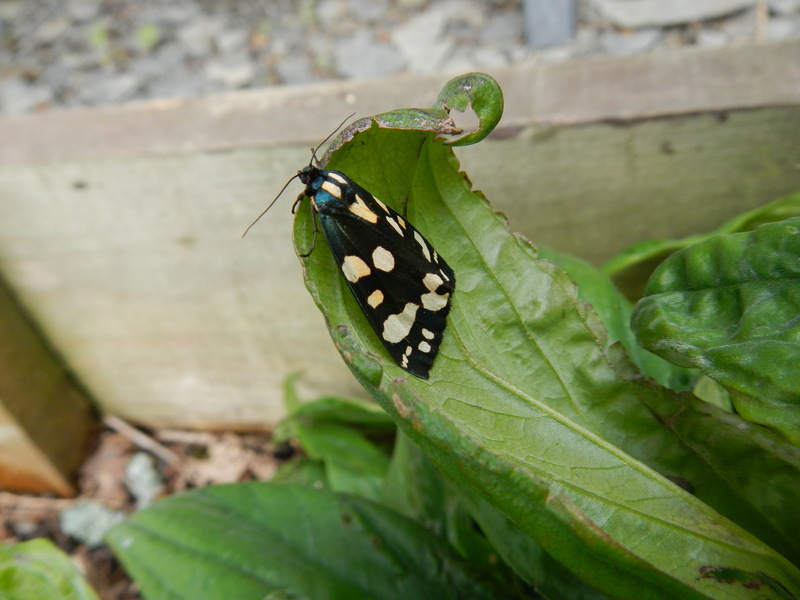 But we didn’t get very far before I spotted two Scarlet Tiger moths sitting right in the open in a flower bed! They are classed as a ‘local’ species in my moth book, which means they are only found in less than 300 sites across the whole of the UK! 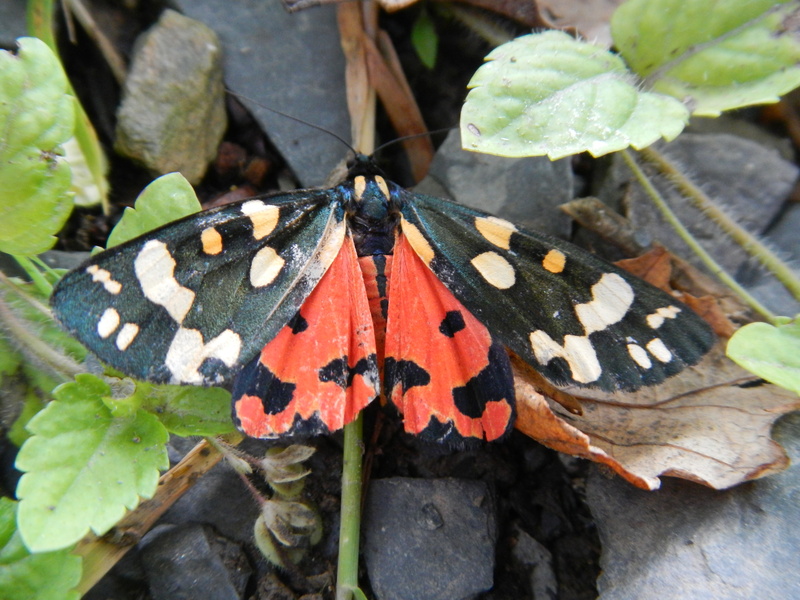 They are called Scarlet Tiger because of the beautiful red hindwings, visible in the second photo. Scarlet Tiger is also a new species for my pan-species list, which I am hoping to expand this holiday. Scarlet Tiger, showing hind wings. A pan-species list is a list of species which covers all groups (fungi, plants, invertebrates, mammals, birds, reptiles, fish and amphibians) found in a certain place. My list is of all species found in Britain and I only started putting together my list this spring. It had 781 species at the beginning of this trip but we’ll see how it expands. After everything was unpacked, I decided to explore the area close to the cottage. The visitor centre closes at 5pm, so I already almost had the whole place to myself! Right next to the cottage is a play area for small children. I found that it was full of wildlife too! Two small Toads were found but were hard to get a good look at as they hopped into a tussock of long grass as soon as I spotted them. I also found a lot of wildlife on the umbellifer-like plants around the play area, mostly Meadowsweet and Hogweed. A large larva had made itself a tunnel of silk from which it fed on the flowers of a Meadowsweet and when I disturbed it it quickly retreated into its tunnel. Lots of Hoverflies were enjoying the sweet nectar of the umbellifers, and there were especially large numbers of Marmalade Hoverfly darting about. Also, annoyingly, Horseflies, or Cleg Flies, were aplenty. I managed to fight them off for most of the duration of my walk, but their persistence paid off when one managed to bite my hand when I was looking at a Brown-lipped Snail! The following morning it was still drizzly as it had been for the whole journey. I did manage an early morning walk to the river viewpoint though, with the hope of finding Otters. Unsuccessfully. Both male and female Blackcaps were present, the male singing its socks off in a tree a metre away from me. Males and females are similar apart from one striking feature: the colour of their cap. The female’s and juvenile’s cap isn’t black at all, but in fact brown. The male’s cap is a glossy black though! During my adventures with bird ringing in southern England, I was fooled by a juvenile Blackcap. We had caught a brown-capped Blackcap in the net during a ringing demonstration, and my trainer asked me whether it was male or female. I confidently said “female!”, but had forgotten about juveniles. My trainer didn’t hesitate to point out a few minuscule black feathers in the cap, therefore making it a male! Moving on from the Blackcaps, I was surprised to see a group of 5 Curlew fly over the river. I had first mistaken the silhouettes of the birds for those of gulls, which are abundant over the river. But their long, curved bills were the stand out feature when I looked through my binoculars! But then, out of the corner of my eye, a spotted a shape. It was swimming downstream, low in the water and diving regularly. Otter? Unfortunately, no. It was in fact a Cormorant, but it fooled me! It was the only Cormorant we saw on the trip which is surprising, I was thinking we’d see a lot more due to the abundance of large water bodies. After breakfast, we embarked on another walk, longer this time. We went on the Wetland Trail, one of the most popular trails for wildlife spotting. It was marked as 2.8km on the map, but it was tiring after visiting all the hides. Throughout the walk we were spurred on by the soundtrack of Sedge Warbler song – the reedbeds punctuated by small shrubs are perfect for them! However the drizzle which was still coming down beckoned the snails onto the path. We had to watch our step the entire way as Brown-lipped, Garden and other snails saw this as an opportunity to cross to the other side. Sadly we saw nearly as many crushed shells as intact ones, other people didn’t seem to be paying attention. From then on I moved every snail I could to safety! Most of the snails were crossing over the tarmacked path where most of the hides were. From the tarmacked path we spotted an Oystercatcher piping as it flew over the reedbeds and five more Curlew from a hide. I must say that Eurasian Oystercatchers are currently my favourite waders. They often nest near human habitation, they have been known to nest in flower pots on patios and are sometimes approachable. They are an unmistakable wader with the mix of black and white and a bright red bill. They are found all over the country, inland and coastal, so they are seen more often than strictly coastal birds like Sanderlings. Also 12 species of Oystercatcher (genus Haematopus) are spread over the whole world, so it’s not only Europe which can enjoy them! We had lunch at the Glasshouse Cafe in the visitor centre, from which you could see the nearby village of Cilgerran, which we walked to afterwards. The village was certainly different to the rural setting around our cottage but it was a chance to find some suburban wildlife: House Sparrows which were absent in the reserve. Also the loose stone walls harboured a lot of plants, including Maidenhair Spleenwort, Wall-rue and some hardy Herb Roberts. The following morning got off to a good start. My dad found a moth in the sink when he got up, put it in one of my pots and showed me when I had breakfast. 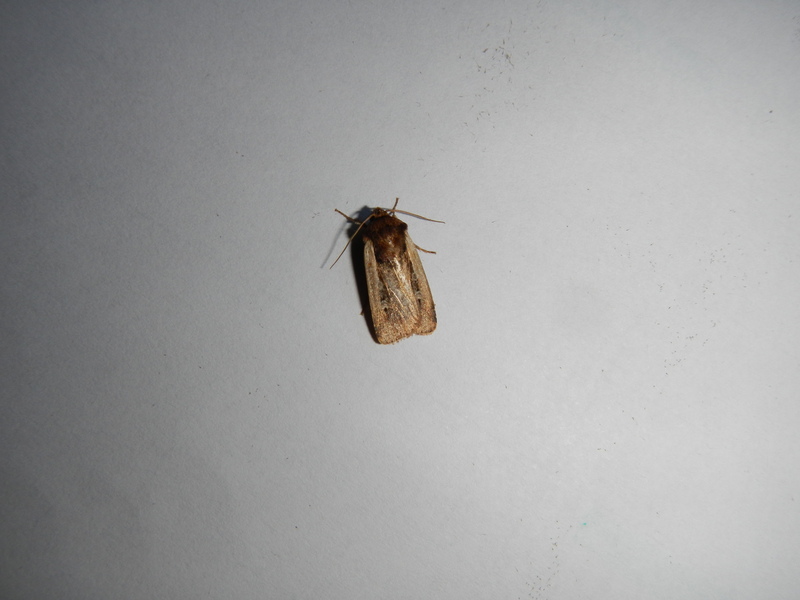 It was a Dark Arches moth which I have caught in the moth trap before at home. It may just be a coincidence but I think it is often found indoors more than other species. I think this because I have found another one at home, but not in the trap. It was in fact on one of our towels! Maybe they like the warmth of human habitation? There were lots of birds down by the beach. When we were just about to walk onto the beach I spotted a Red Kite circle over ‘the last pub before Ireland’ before heading west (in the direction of Ireland). The Red Kite was being mobbed by Corvids, namely Jackdaws and Carrion Crows, of which there were a lot. On the way back to the reserve I saw a Buzzard being mobbed by around a hundred Jackdaws! None, apart from one or two, were very persistent and gave up after a few minutes. Also from that pub we had a great view of a feeding Whimbrel, with a huge flock of Canada Geese. I was hoping to spot some dune fungi by the beach, but unfortunately none were to be seen. 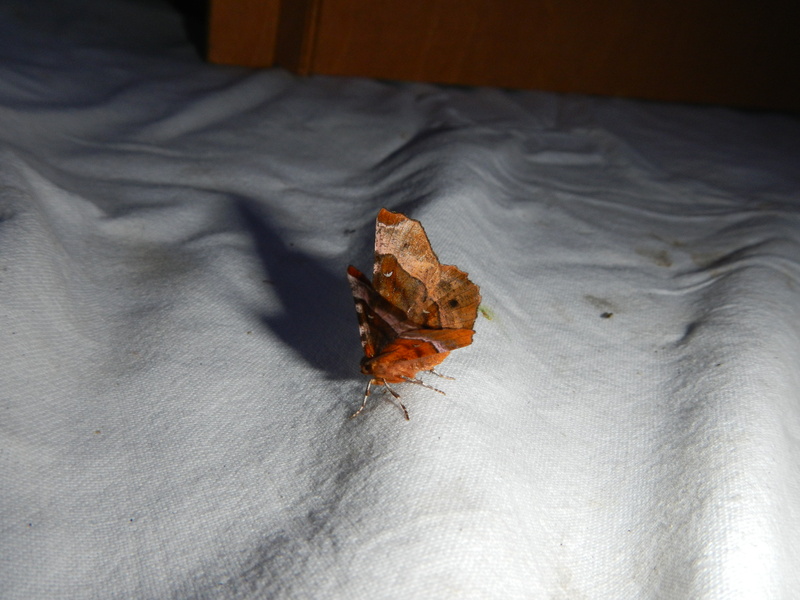 I got up at 4:45 am the next morning because I had set the moth trap and was anxious to see what we’d caught. 2 Brussels Laces. These were the only scarce moth we caught in the trap, and a new species for me. They’re quite a drab moth, similar to the Willow Beauty, but much smaller. 1 Elephant Hawk-moth. I was really pleased when I caught an Elephant Hawk-moth in the trap, as they seem to avoid me. It’s the first ever one I’ve caught in my trap, whereas other people have caught 22 in one night! 2 Clouded Borders. I was really thinking we would catch more as I catch numbers in excess of 10 at home. They’re related to the magpies, Clouded Magpie and Magpie. 1 Magpie. The Magpie we caught in the trap was the first I’ve ever seen and it was also the second largest moth in the trap, after the Elephant Hawk-moth. 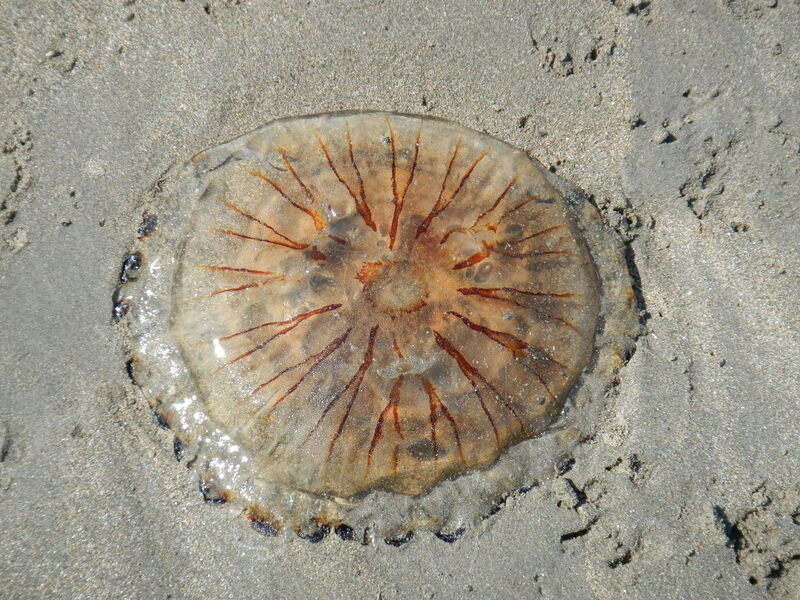 They’re larger than Clouded Borders and covered in spots instead of black patches. 7 Uncertains. 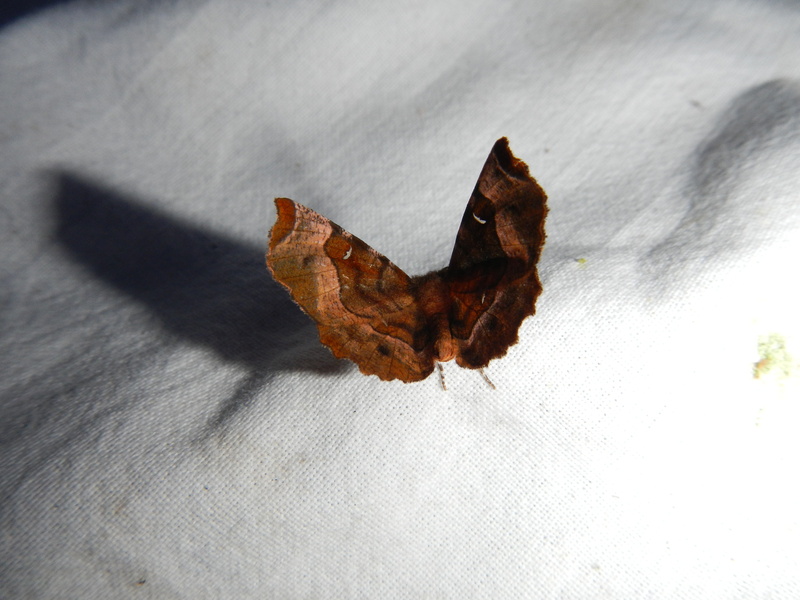 These are the common LBJs (Little Brown Jobs) of the moth world, but they have a great name! 2 Riband Waves. There are two forms of the Riband Wave: the banded and non-banded. I find that they are both abundant but some nights I catch more of one than the other. 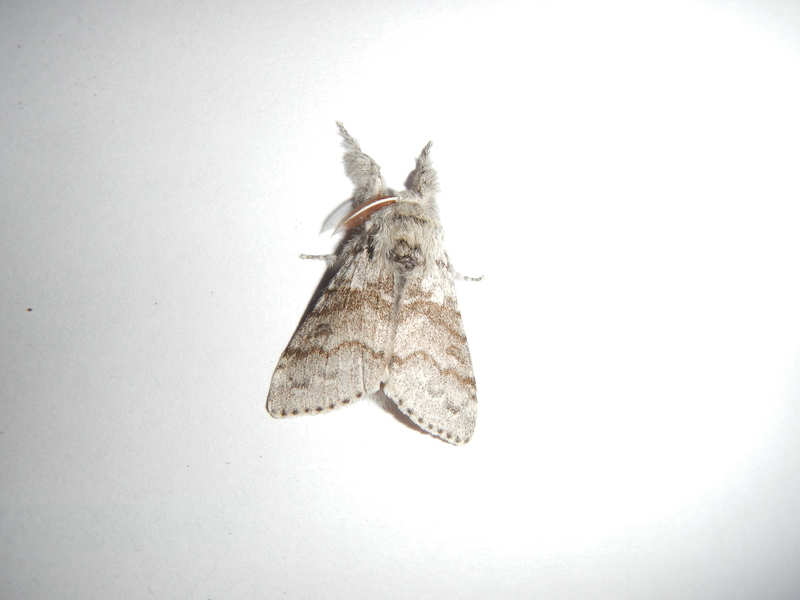 Both Riband Waves we caught were non-banded. 2 Buff-Tips. I am always amazed by their camouflage. 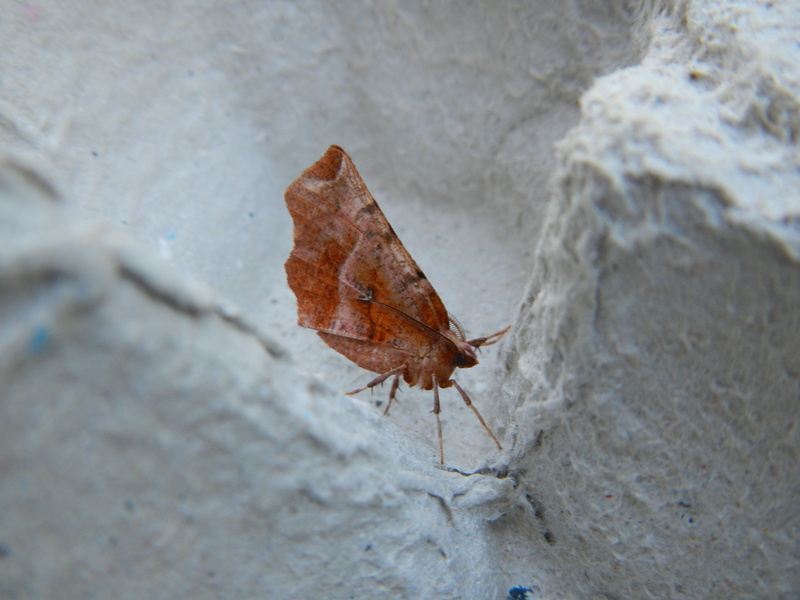 When I discovered one on the bug house next to the moth trap in the morning I actually thought it was a twig! 1 Buff Ermine. These are common moths and I never fail to catch them when I put the trap out at the right time of year. 1 Buff Arches. 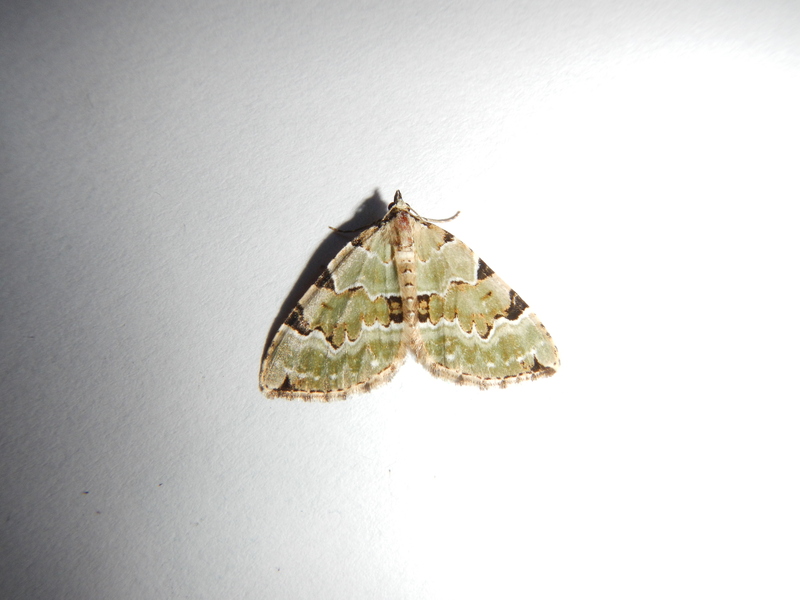 This concluded the buff moths of the night, but it’s the prettiest of the three. 1 Common Wainscot. 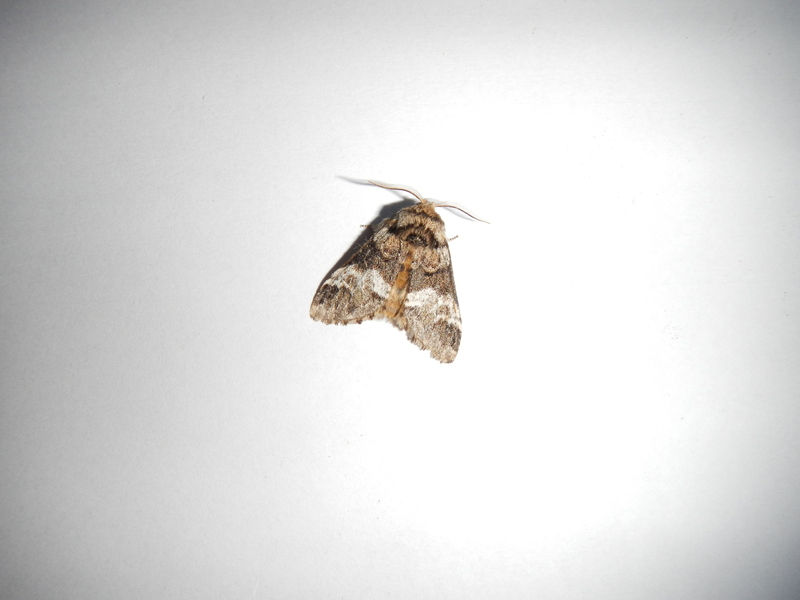 This is quite a drab, pale moth which is average sized. It flies earlier in the year than other wainscots. 1 Snout. Snouts are a large, odd moth. They actually look like the have a snout which gives them a comical appearance. 1 Drinker. 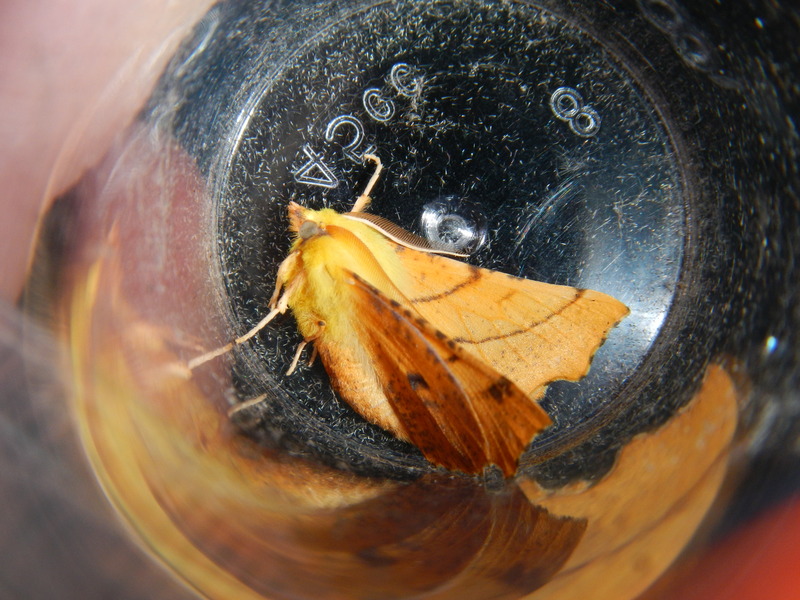 After catching one in the trap in Wales, the Drinker became my favourite moth. It also has a snout like the Snout, but when I saw it wiggle its nose it looked like it had just sneezed! 2 Shaded Broad-bars. These confused me for a while as I have never caught them before. Their colour can be quite variable, ranging from yellow to brown. 1 Spectacle. These moths are distinctive as they have marks at the front of their head resembling white-rimmed spectacles! 1 Southern Wainscot. It was great to catch one of these as they are a localised species and a reedbed specialist, so this reserve is a great place for them! 3 Lackeys. Two males and a female caught in a trap. The females are larger than the males and usually paler, but the colour is variable. So not as many as I thought I would catch. But there were still a few new species for my list: Southern Wainscot, Shaded Broad-bar, Magpie, Lackey, and Brussels Lace. For today’s walk we went to Cardigan Castle. Good for history but not so good for wildlife! The walk there was quite good though, as we followed the river most of the way. One of the highlights was when I spotted a lone Sand Martin fly upstream, had to pick out from the 100+ Swallows and House Martins also hawking above the river. It’s my first one this year! I also managed to find a Small Tortoiseshell flitting between buildings, which I expect is one of the few I’m going to see this year as sadly they don’t seem to be doing well. Unfortunately that was the end of our incredible holiday. Sadly no Otters, but that doesn’t matter as I was amazed by the amount of wildlife we saw in less than a week! At the beginning of this post, I said that I was hoping to expand my pan-species list this week. I was very successful! I added around 50 new species, including 18 plants! 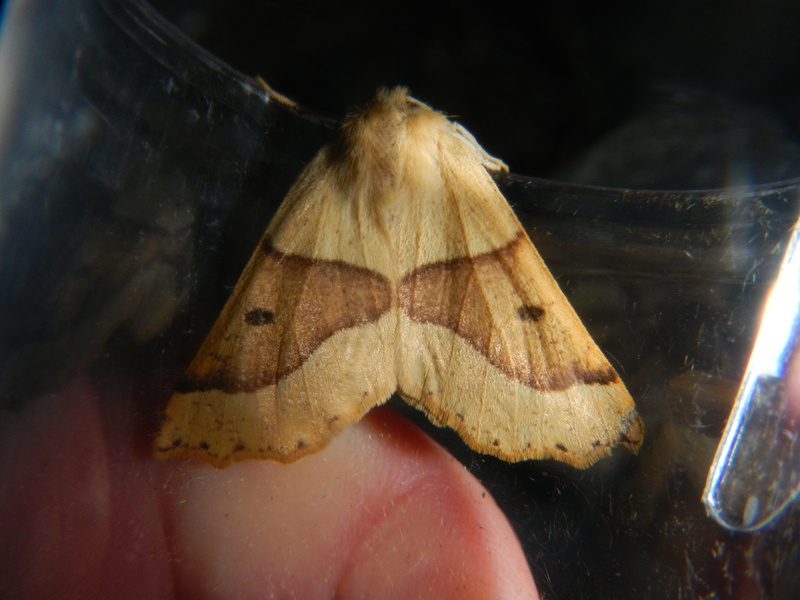 Out of the 8 moth species we caught, 7 were new in May. 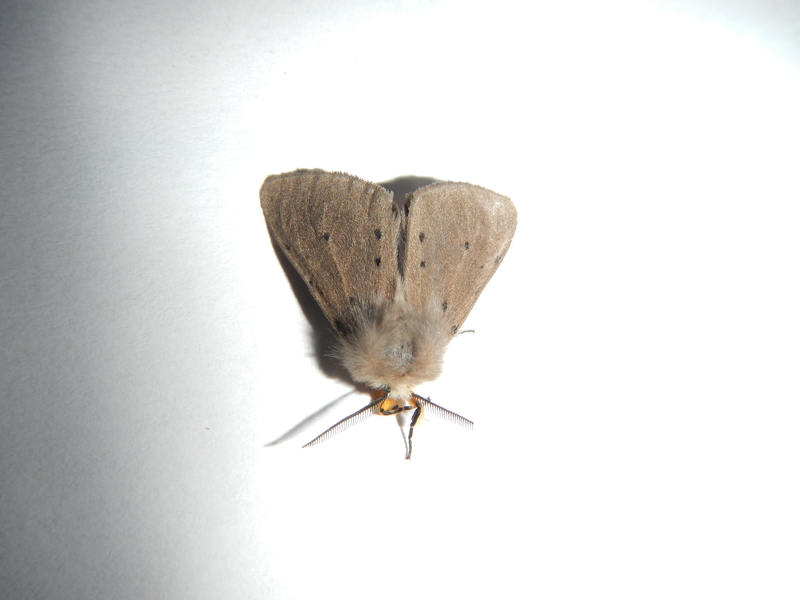 We had caught Pale Tussock in early May. 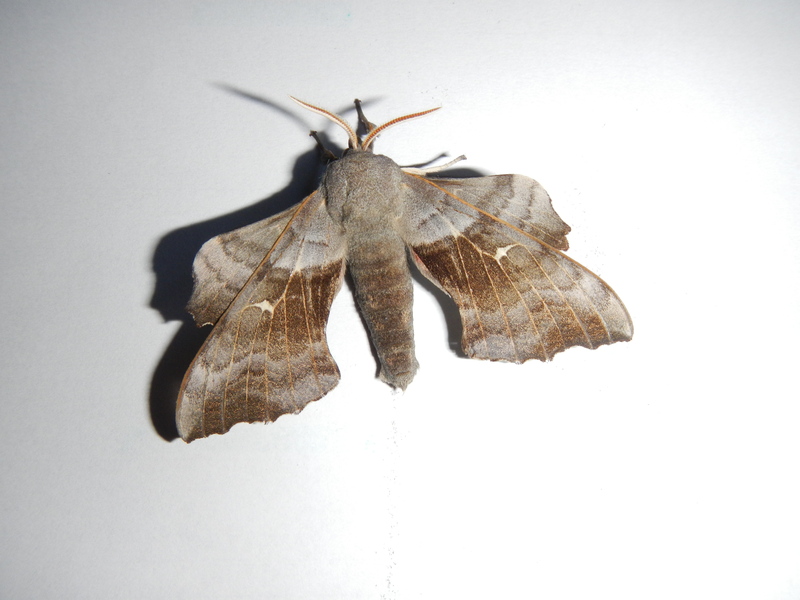 Also, we had seen a pair of Poplar Hawk-Moths mating in the summer of 2013, but this is the first time we have caught one in the trap. The Scorched Wing is an absolutely beautiful moth. The faint lines across the fore- and hindwings give the impression of fast movement and the edges of the wings have a scorched appearance. The females are rarely seen and the males rest with the tip of the abdomen curled up, which was observed but it’s not visible in the photo. 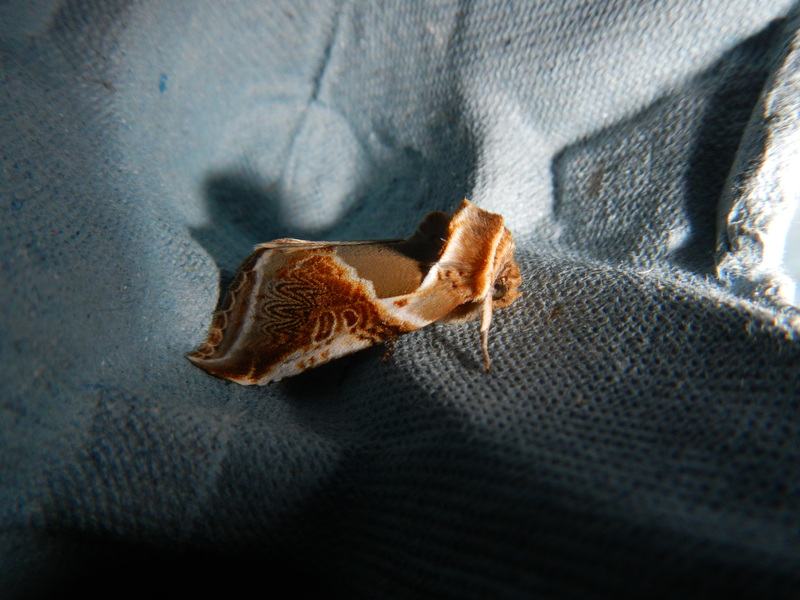 Therefore I think it’s likely that the one we caught was a male moth. My moth guide says that the UK status is ‘Local T’ which means it has only been recorded in 101-300 sites in the UK, which are spread throughout the country.